The sophomore record is always the tricky one right? Isn’t that the way it goes? A band does something great, can that band do something great again? 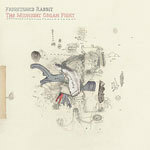 I believe this is the case with Frightened Rabbits’ newest record The Midnight Organ Fight (TMOF). If you’ve been on this site, you’ve probably seen that I’ve been watching these guys for a while. I’ve had time absorb their newest record and I’ve become quite a bigger fan of these three Scots from Selkirk. 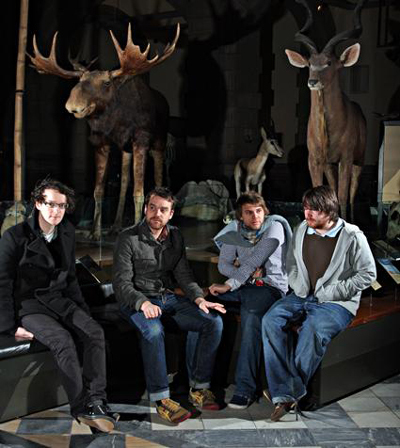 2007 had the band touring tirelessly on the re-release of Sings The Greys (FatCat), the bands first record and smash introduction. Songs from Sings the Greys were written over a 2-year period while the new songs off TMOF were comprised quite quicker as a whole, with more time spent on preparation for recording. The record was produced by Peter Katis (Interpol, Spoon, The National). The new album is best described as a ‘series of filmic vignettes, snapshots of self-destructing relationships and self-destructive behaviour, dark snippets sewn together into an ultimately uplifting drama of the everyday.’ Its optimism with an underlying darkness to it. True honesty and intrigue in these stories. Still a three piece with Billy Kennedy and Scott Hutchison playing guitars, Kennedy’s dropped an octave to add weight to a bass-player-less band. Grant Hutchison’s drums add the necessary texture to make this three piece sound like many more. Head Rolls Off is not only a killer video, but my best guess at grabbing the attention of the masses. Old Old Fashioned is a, like the name, old fashioned foot-stomper. Poke (head to Sound Of Marching Feet to get it) is on the softer side, but truly beautiful. Definitely a solid record, you’ll see it again on my best of this year list for sure. On and off for the past couple of weeks, I’ve opened a new tab and run the myspace audio player from Frightened Rabbits’ myspace page. It was Head Rolls Off that hooked me, often getting played 3-4 times consecutively on my computer speakers. It will be the first single off The Midnight Organ Fight (FatCat), out on April 15th. Apparently, the new record ‘maintains its predecessor’s unpretentious universality yet adds an un-scraggly grandiosity that was mostly absent from the debut’. Hope I can get some people to see them play at SXSW this year. Last year at Hot Freaks they were great.